How to Make a Beautiful DIY Table with SYP | Wood. It's Real. | Wood. It's Real. When informed that his family would be hosting a full house for Thanksgiving, engineer and woodworker Jamison Rantz aka The Rogue Engineer knew he needed to put his skills to the test. After his wife pulled some ideas, he got to work. 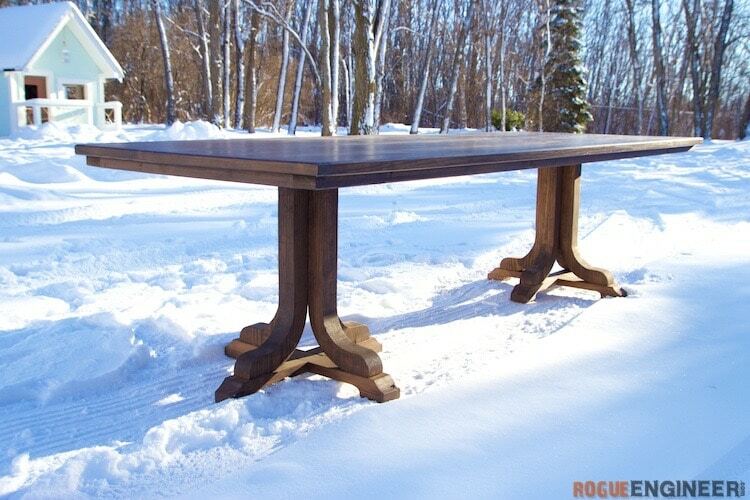 Eventually, he crafted this gorgeous wood table for a total cost of $125. The for the top, he chose Southern Yellow Pine because it’s beautiful, affordable, and grown in the USA. Check out his plans, and a video that shows how he built it by clicking here. And check out the video of his shop, super impressive. This is not a beginner’s project, but the plans The Rogue Engineer puts together are clear and straightforward. What do you think? Could you tackle this project? Let us know and tell us how it goes. Also, Jamison lives in Michigan (could you tell?). And he was still able to get his hands on Southern Yellow Pine, which is great.